Cozumel offers one of the best scuba diving destinations in the world! With crystal clear waters, and abundant sea life, you can scuba dive or snorkel to your heart's delight. But even if the water is not your thing, there's plenty more to do here. Learn more here! Cozumel offers one of the best scuba diving destinations in the world! With crystal clear waters, and abundant sea life, you can scuba dive or snorkel to your heart's delight. But even if the water is not your thing, there's plenty more to do here. 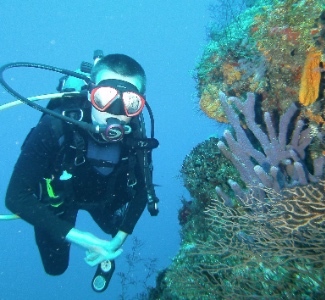 What to do in Cozumel if you are not a scuba diver? Well, there are plenty of shopping opportunities. There is one small town that is very walkable with shops galore selling jewelry, t-shirts, souvenirs, homemade crafts, seashells, you name it. Cozumel is a relatively safe vacation destination where you'll find the local population to be friendly, kind and civilized. It is extremely safe to stroll downtown San Miguel in the evenings, even for unaccompanied women. 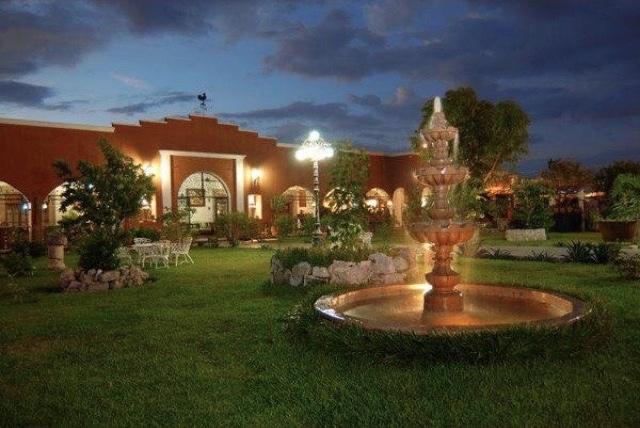 This makes it a great place to explore both the busy little city of San Miguel as well as the rest of the island. Visit El Museo. This museum is in a gracefully-designed building on the corner of Calle 6 and the waterfront. It is a very pretty structure with several small but attractive and informative exhibits. Nice gift shop and a fun gallery restaurant upstairs serving decent food at inexpensive prices and an awesome view of the Yucatan channel. There is often original art for displayed here for sale by local artists. 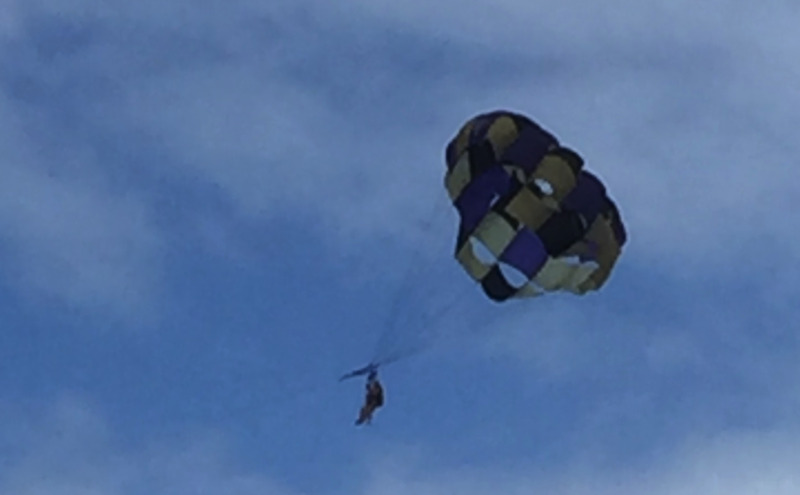 Other water activities available are parasailing, Boating, Deep Sea Fishing, water trampolines, kayaking, glass-bottom tours, sunset dinner cruises, sailing, jet skis, beach combing, etc. Within less than a 30 minute drive from downtown, you can visit the ancient Mayan ruins of San Gervasio. These small but very picturesque Mayan ruins are located in the center of the island half way along the cross island road that bisects Cozumel. 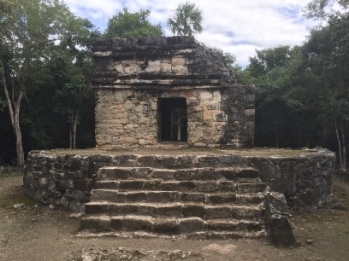 For centuries San Gervasio was a mecca for Mayan women from the mainland who made the pilgrimage to the island by dugout canoe to worship at the shrine of Ixchell, Mayan goddess of fertility. Then you can visit the Punta Sur National Park, located at the southern tip of Cozumel. You'll see rugged, wild, sandy beaches with gentle wave action, a great, climbable lighthouse, museum and large Columbia Lagoon which teems with nesting birds at some times of year. But beware of the crocodiles, which, the rangers assure us, do NOT like people. The eastern "Wild side" of the island is just that - wild! Hurricane Gilbert wiped out the electricity on that side of the island and it has since been deserted. There are a few beach bars, such as the Paradise Cafe, that will be very excited to see you if you pop in and get a cold margarita or beer. Chen Rio, which is good for families because of its protected cove and Mezcalitos is known for their great shrimp. Just don't even try to go swimming on this side of the island. The waves and currents are dangerous. 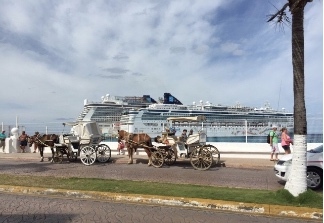 Transportation: Horse and Buggy rides are quite fun and romantic. You can also rent a car, jeep or a scooter or take a taxi around the island or to one of the many beaches. Chankannab Park is a $7-10 cab ride from downtown. Always ask the taxi driver for the rate before you even get in the car. Some of them are known for charging too much. There are posted rates by the main boat pier. I would recommend familiarizing yourself with the going rate or you might end up paying double. Admission to the park is $12/person but it is worth it. This park is truly beautiful and tropical. There are restaurants, snorkel rentals, gardens and a little museum. There's a protected lagoon that's perfect for young children. And if you happen to be on the island on a Sunday evening, go downtown to the pedestrian-only plaza between 8 and 9 PM. There is often some kind of free event going on here on Sunday evenings, such as live music and dancing, a beauty pageant, a children's show, or religious event. It's a great place to people watch and mingle with the locals who come out in droves. 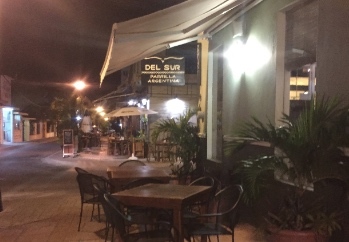 For such a small island, Cozumel has more than its fair share of excellent restaurants. The owners of BeachHouse.com have visited Cozumel many times and some of their recommendations are Casa Mission, Del Sur (Argentinian steak house $$$), The Lobster House (best lobster on the island, of course), La Perlita (recommended by their dive master - TONS of food for very few pesos), Kondesa (wonderful outdoor patio), and Kinta (fantastic food and service). There are seriously so many great places to eat, that you could visit Cozumel just to eat and you'd have a great time. (1) It's a GREAT VALUE. The American $dollar goes a long way in Mexico. You'll be shocked at how well you can eat and drink for way less than a similar meal would cost in the US. (2) CONVENIENCE. Cozumel is very easy to get to. It is a short flight from most cities in the US. (3) SAFETY and FRIENDLINESS. They really are nice people. And while it is generally safe, meaning you are not likely to get attacked or kidnapped, you do have to be careful about theft. Don't leave anything of value out in your room and watch out for pick pocketers. (4) FOOD and BEACHES. Both outstanding on this island. The waters are gorgeous turquoise and blue. Sparking clear. Up to 100' visibility for snorkeling diving. Every water sport imaginable. So don't wait any longer! Book one of the great beach houses or condos listed here and have yourself a great time!